A blog by someone who has a love of great food, craft beer, fine wine and, of course, cooking. Every once in a while, I have a dish that turns out perfectly. It is a dish that fires on all cylinders and, from start to finish, everything falls into place. It is a dish that, once plated, makes me actually look like a chef. This is one of those dishes ... Pan Seared Fish with Gazpacho Sauce and Black Olive Tapenade. The recipe comes from a cookbook that I bought several years ago. My beautiful Angel and I visited the Little Inn of Washington for a brief vacation. We had dinner there, which was perhaps one of the best meals that I have ever had. The kitchen, and, indeed, the entire inn, is run by chef Patrick O'Connell. We had the opportunity to meet the chef and, before the trip was over, I had purchased a book of his recipes. The book is Refined American Cuisine. That book sat on my cookbook shelf for a very long time. I have to admit that many of the recipes seemed daunting. A kind of culinary intimidation, looking at something that I thought was unattainable given I lacked the skills and experience of a chef, let alone a chef of Patrick O'Connell's statute. I have come to learn that there are emotions more powerful than fear. One such emotion is love. My love for my Angel propelled me to open that cookbook and search for a recipe to make for her. 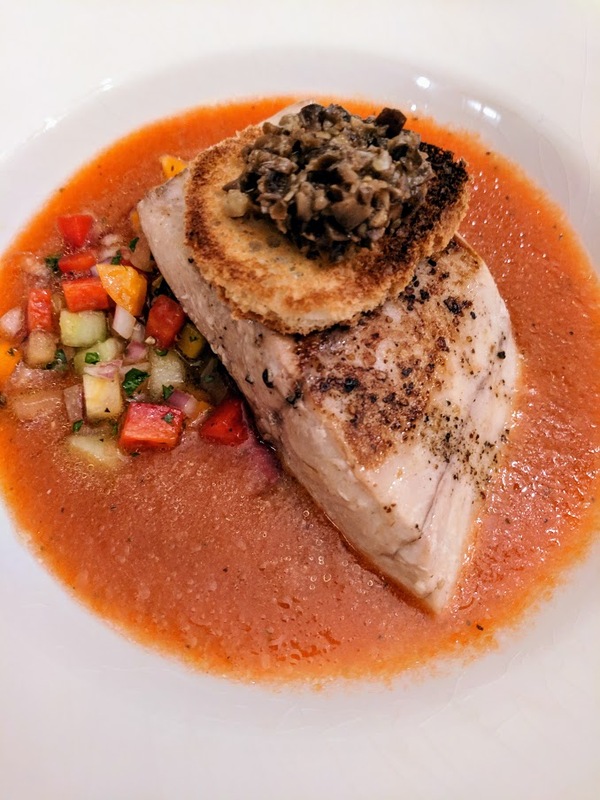 I decided to make Pan Seared Fish with Gazpacho Sauce and Black Olive Tapanade. 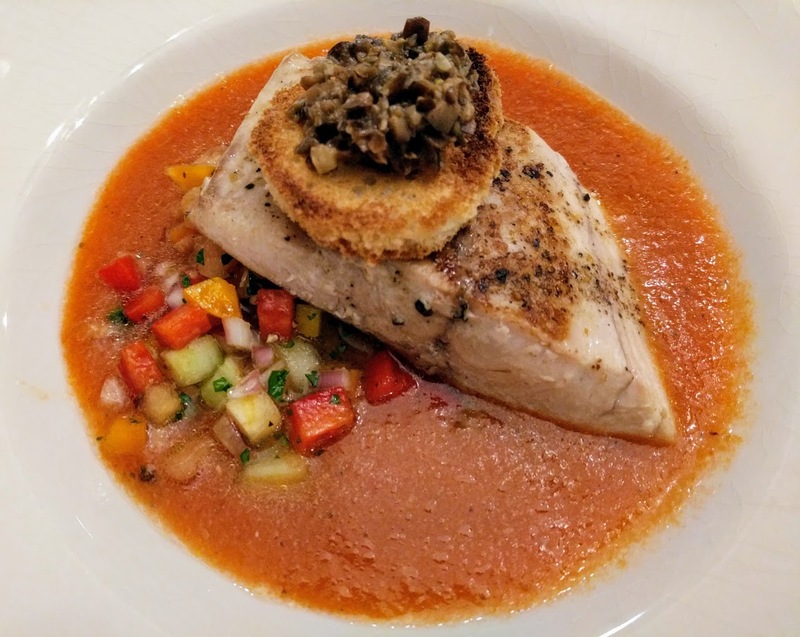 This dish combines the simplicity of a pan seared fish with the brightness from a gazpacho. The crust created by the salt and pepper in the pan provides a flavorful start and an interesting contrast to the silky, smooth gazpacho. The fresh vegetables provide a second contrast to the gazpacho. All of which is topped off by the earthy black olive tapenade. 2. Prepare the gazpacho salsa. In a small mixing bowl, combine the tomato, cucumber, bell peppers, jalapeno pepper, red onion and shallot. Stir in the parsley, tarragon, celery salt, extra virgin olive oil and sherry vinegar. Season with salt and pepper and refrigerate. 3. Prepare the croutons. Preheat the broiler. Cut out six rounds of bread, about 2 inches in diameter, and place them on a baking sheet. Toast the bread rounds under the broiler on both sides. Spoon the olive tapenade on the toasts and set aside. 4. Prepare the fish. In a non-stick skillet, heat the oil over high heat. Season the fish on both sides with salt and pepper. Cook the fish, skin side down, for about 2 minutes or until the edges are crisp and golden. Flip the fillets and cook them on the other side for about 30 seconds. Keep warm. 5. Finish the dish. Pour 2 tablespoons of the gazpacho sauce into each of 6 serving bowls. drizzle a small amount of extra virgin olive oil around the sauce. Place 1 tablespoon of gazpacho salsa in the center of each bowl. Place 1 hot fish fillet on top of the salsa and lay 1 crouton of black olive tapenade on each one. For the few avid readers of my blog, you might have noticed a trend in some of the posts. That trend involves South Korean-inspired recipes. (I say inspired because, let's admit it, I am not a professional chef, and, I am a total rookie at cooking South Korean food). It began with my personal culinary challenge to cook a main course (and two appetizers) from South Korea, which was part of my Around the World in 80 Dishes. 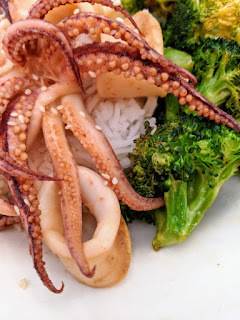 That was followed by an effort to Ojingeo Bokkeum (South Korean Spicy Squid). And, then, there was the efforts at experimentation, first with Gochujang Chicken and now this recipe, a effort to create a Bulgogi-style squid. I realize none of this actually comes close or even approximates true South Korean cuisine, but, there is something about the use of peppers -- whether Gochujang or Gochugaru -- that has gotten my attention. The heat of the chiles used in South Korean cuisine are different than the chiles used in other cuisines, such as the Piri-Piri chile, the Ancho chile, or my beloved Hatch chile. This recipe goes in a different direction, away from the chiles toward bulgogi. I have made one bulgogi recipe in the past ... Flank Steak Bulgogi. I noted in that post that flank steak is technically not the right cut of beef for Bulgogi. (It is ribeye.) Now, I am throwing everything to the wind and using perhaps one of the most un-Bulgogi of ingredients: namely, squid. This was an experiment in creativity and, for a first time, it worked out fairly well. The sweet (honey and sugar) combined with the salty (soy sauce), tied together by garlic, ginger and sesame to produce a fairy tasty dish. 1. Prepare the squid. Combine the soy sauce, lemon juice, brown sugar, honey, rice wine (or mirin), garlic, ginger, and sesame oil. Add the squid and toss. Cover and refrigerate for at least 1 hour. 2. Cook the squid. Heat a pan over medium high to high heat. Add the squid in batches and cook covered for about 3 to 4 minutes or until translucent. 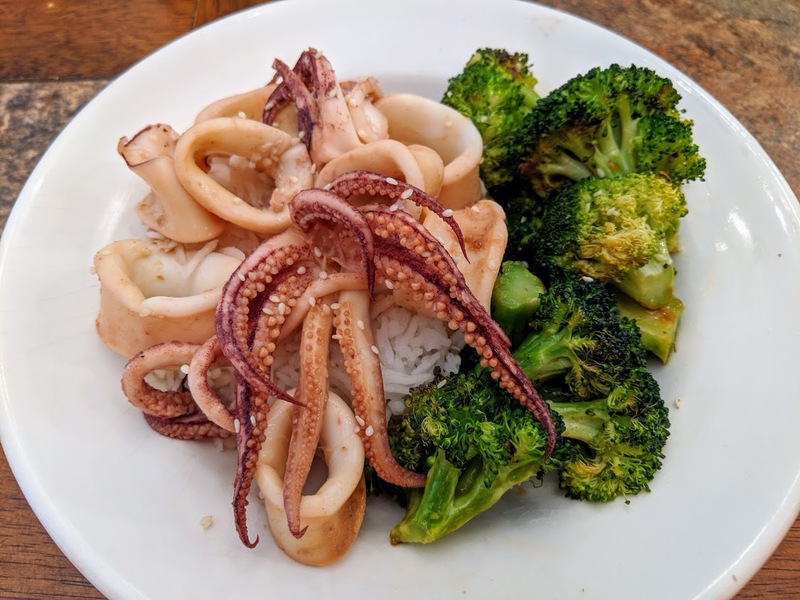 Once the squid is cooked, serve with rice and a side, like broccoli. For me, fusion cuisine is something of an issue. I am a big fan of a wide ranges of cuisines, for the ingredients, the cooking processes and, of course, for the dishes produced. When one starts picking and choosing from two or more cuisines to produce a dish, that becomes a little more problematic. To be sure, there are some very good examples of fusion cuisine. But, there are also a lot of misfires. Yet, despite all of my misgivings about fusion food, this recipe caught my attention. It involves the fusion between Mexican cuisine and Indian cuisine. 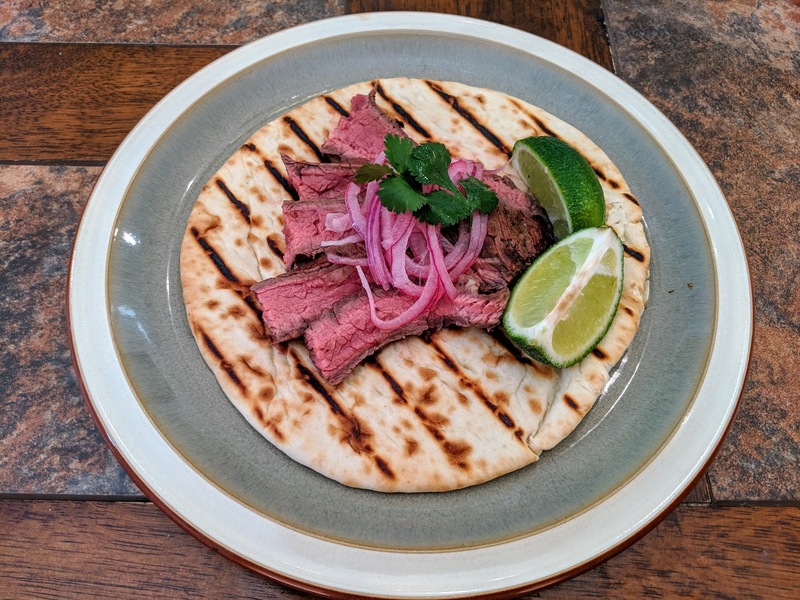 The smells and flavors of Masla-marinated meat served in naan to produce what is one of the most quintessential dishes of Mexican cuisine ... the taco. Perhaps it is the fact that I like tacos. Maybe it is the fact that I love Indian cuisine. Either way, I was determined to make this recipe. 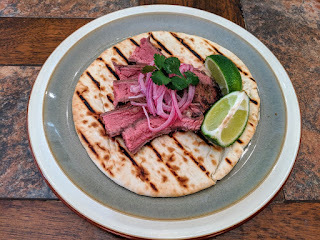 And, apart from the need to improve my ability to cut flank steak on a bias, the recipe got me to rethink my view about fusion cuisine. The key to this recipe is the masala. It begins with the classic of garlic and ginger, but only chiles, vinegar, curry leaves and onions are added to complete the masala. (If you don't have curry leaves, don't worry, it will still turn out well.) Once the masala is prepared, then the meat must be marinated. The recipe calls for at least one hour of marination, but I would go at least two hours if not a little longer. Once the steak is marinated, a quick grilling over high heat on the grill ensures that the steak will be incredibly delicious. Just cut it on the bias to reduce the chewiness and serve with grilled naan, the onions, and the cilantro. Maybe fusion food is not that bad after all. 1. Prepare the masala. In a 12-inch skillet, heat the canola oil over medium-high heat. Add the onions and cook until translucent and lightly golden, 3 to 4 minutes. Add the curry leaves, garlic, serrano (or jalapeno) and ginger and cook until fragrant, 2 minutes more. Remove from the heat and transfer to a blender with the remaining masala ingredients. Blend until smooth and let cool completely. 2. Marinate the meat and the onions. In a large bowl, toss the flank steak with the masala to coat. Refrigerate for at least 1 hour. Meanwhile, in a small bowl, toss the sliced red onion with lime juice and set aside. 3. Grill the meat. Light a grill or heat a cast iron grill pan over high heat. Grill the steak, flipping once until caramelized and medium rare, 7 to 8 minutes. Let rest for 5 minutes, then thinly slice against the grain on a bias. 4. Finish the dish. 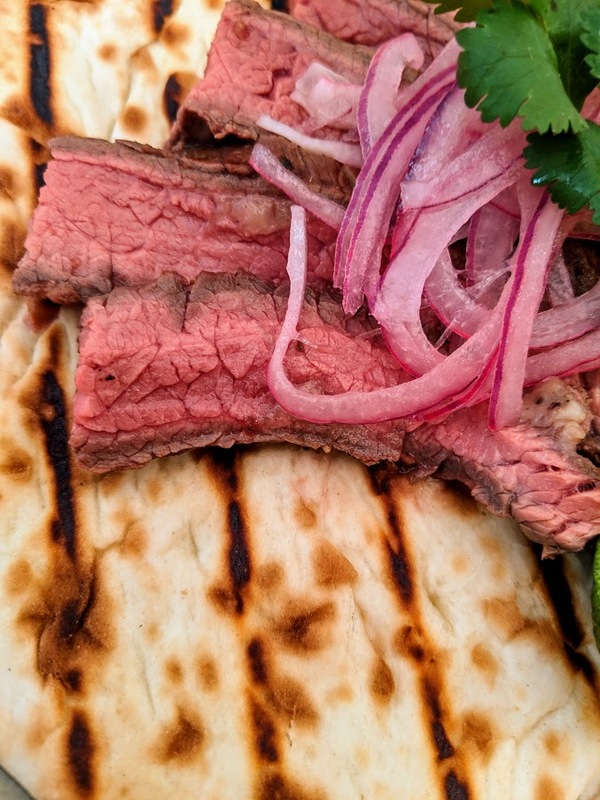 Serve the steak with pieces of grilled naan, sliced red onion and lime wedges, garnishing with cilantro leaves. If memory serves me right, it has been a long time since I have stepped foot in Savage Bolek Kitchen Stadium. My last challenger -- Radish Sprouts -- got the better of me. While the three dishes each highlighted a certain creativity (for who would have ever thought of a radish sprout broth), the execution fell short of the expectations that I had set for myself. After that challenge, I decided to take a sabbatical from the Iron Chef battles. I needed to work on my creativity, my skills and my dishes. As the days, weeks and months passed, I spent my time trying new foods, cooking with new ingredients, and honing my skills. But, as helpful as this time away from Savage Bolek Kitchen Stadium has been, the Iron Chef must return to face another challenger. A challenger who could be as creative and crafty as the Iron Chef. Coming from far away, this challenger will present the Iron Chef with many more opportunities to express not only his creativity, but his love for cuisines around the world. Allow me to introduce the challenger ... OCTOPUS. The first course is a nod to Japanese cuisine, with Taku Su, a cold salad that combines octopus with cucumbers and seaweed. All of the ingredients are tied together with a vinaigrette of soy sauce and rice wine vinegar with sugar and salt to round out the taste . 1. Prepare the octopus. Slice the octopus very thinly. 2. Prepare the cucumber. Alternatively peel a 1/2 inch side strip lengthwise, leaving a strip intact. With this method, the cucumber slices have some decorative dark green accents and a little bit of extra crunchiness. Cut the cucumber into small pieces using the cutting technique Rangiri. 3. Prepare the seaweed. In a small bowl, soak the dried seaweed in warm water. Let it soak for 15 minutes. Drain and squeeze the liquid out. Set aside. 4. Prepare the vinaigrette. In a medium bowl, combine all the ingredients for the vinaigrette. 5. Finish the dish. 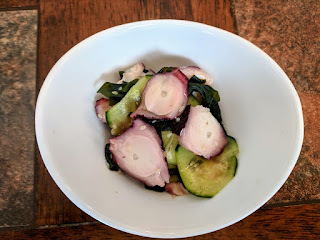 Add the cucumber, octopus, seaweed and sesame seeds and toss all together. Chill in the refrigerator for 15 to 30 minutes. Serve immediately. 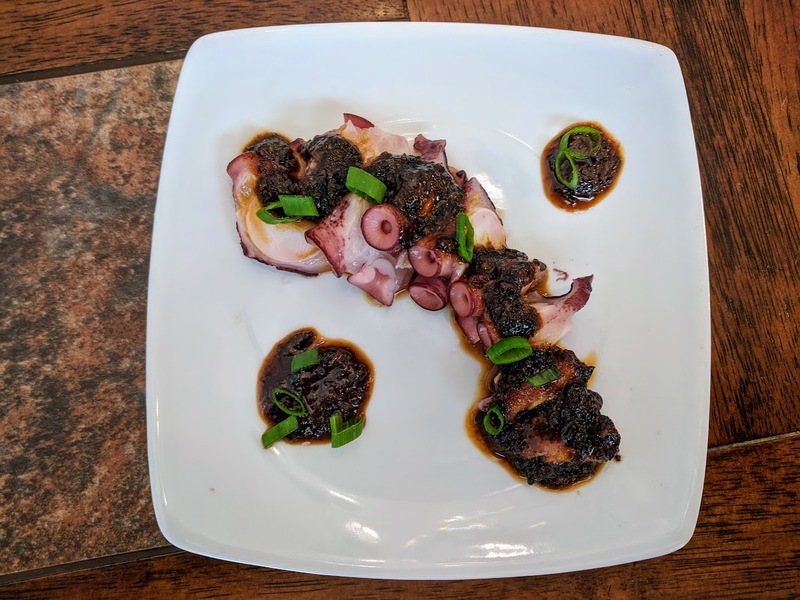 The second course takes its inspiration from Mexican cuisine, with the octopus being served with a sauce featuring the smoky heat of ancho chiles and the sweetness of honey. 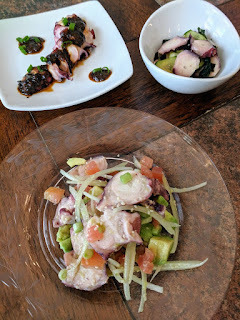 Much like the Tako Su, the mild flavors of the octopus work as a tableau upon which the flavors of the sauce can show themselves. The hardest part is making sure that the octopus itself, as the secret ingredient, is not eclipsed by that sauce. 1. Prepare the sauce. Toast the chiles over moderate heat, turning, until fragrant and pliable, 2 to 3 minutes. Add the vinegar, honey and garlic and bring just to a simmer. Remove from the heat and let stand until the chiles are softened, about 20 minutes. transfer to a blender and puree until smooth. With the machine on, add the grapeseed or vegetable oil until incorporated. Season the sauce with salt. 2. Prepare the grill or broiler. Heart the grill or broiler. Grill the cooked tentacle until the suckers start to crisp and brown around all of the edges, about 4 minutes. For the final dish, I draw upon Hawaiian cuisine. 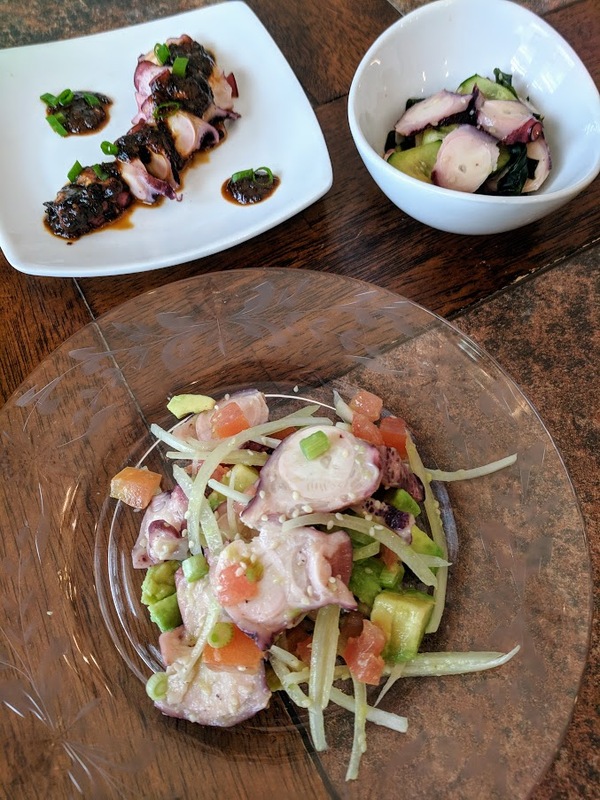 This is a play on the popular dish of Ahi Poke; however, instead of the rare tuna being the star of the poke, it is octopus. The avocado, tomato and onions in this dish, combined with the lemon juice, provide a very bright background that allows the octopus to take the center stage. 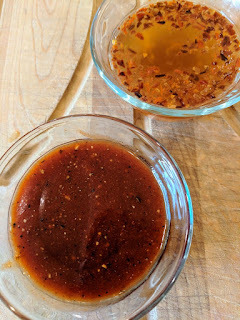 The fish sauce provides that salty, umami flavor that rounds out the dish . 1. Prepare the avocado. Pit the avocado, peel and dice. Put the diced avocado into a bowl and mix with 1 tablespoon of lemon juice to prevent discoloring. 2. Prepare the onion. Cut the onion in half and slice thinly along the grain. 3. Prepare the octopus. Slice the octopus. Put it in a bowl and mix with the fish sauce and garlic. 4. Prepare the rest of the ingredients. Cut the tomato roughly and chop a generous amount of green onions. 5. Combine ingredients: Put the avocado, onion, tomato, green onions, sesame oil and white sesame seeds in a bowl and mix. Chill in the refrigerator. 6. Plate the dish. 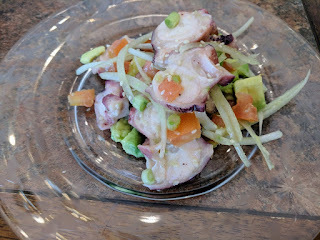 Just before plating, add the octopus and mix well. 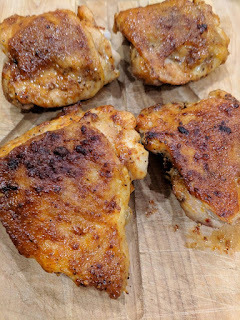 This recipe is an experiment wherein an air fryer recipe never made it into the air fryer. As readers of this blog probably know, my beautiful Angel and I recently bought an air fryer. I am intrigued by air fryers, because I have basically given up on a deep fryer. I did not want to deal with the leftover oil. When one adds the negative health aspects of deep fried food, that made it easy for me to move on from a deep fryer or event the cooking process. When I recipe called for deep frying, I would broil it or grill it. Last Christmas, I got an air-fryer cookbook. There are a lot of interesting recipes in that book, including one for Gochujang Chicken. The Gochujang sauce got my attention. I wanted to make that sauce. However, the recipe in the book called for the use of chicken wing sections. I had bone-in thighs. 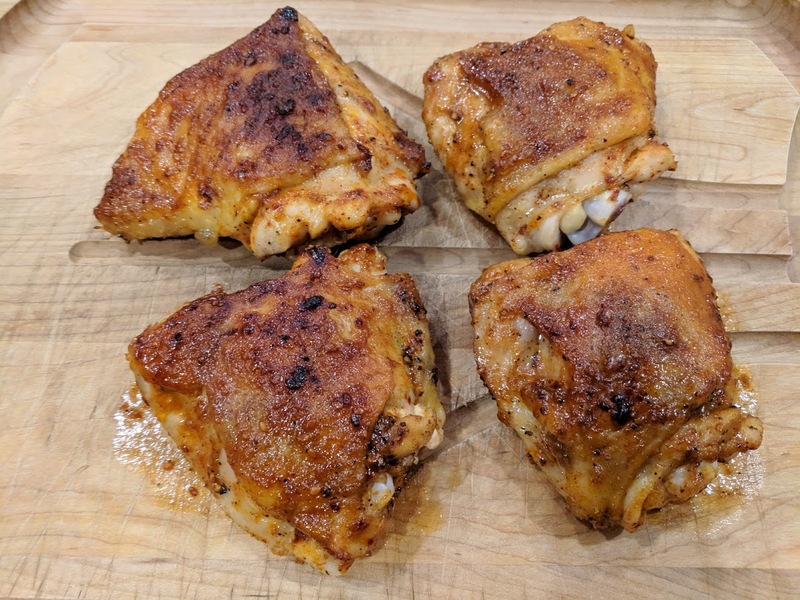 While I could have thrown those thighs into the air-fryer, I needed the cooking times for bone-in thighs in an air fryer. After looking around the internet, I just decided to cook the thighs in a conventional oven. Overall, the recipe worked very well. I was able to get the skin crisp, the heat from the sauce was present, and, there were chicken thighs, which are perhaps the best part of the bird. This is the type of experimentation that I hope to do more in the future! 1. Make the sauce. In a small bowl, combine the gochujang, sesame oil, ginger, garlic, sugar and agave, set aside. 2. Cook the chicken. Place the chicken skin side down and cook at 360 degrees Fahrenheit for 8 minutes. Spread some of the sauce on the chicken and flip the thighs. Spread more of the sauce on the skin and underneath the skin. Continue cooking for about 6 minutes more or until the chicken is browned with crispy skin and with an internal temperature of 165 degrees Fahrenheit. Remove from the heat, let rest for about five minutes, and serve immediately. It is the early 1930s. The Great Depression has settled in, but, for some reason, you find yourself at the corner of East Wacker Drive and North State Street. That intersection near the heart of downtown Chicago. At the corner, you watch Packards and Cords drive by. As you turn your head, something catches your eye. It is an Italian restaurant called Vesuvio. The hunger pangs in your stomach tell you it is time for a meal. You walk over to the restaurant and open the door. Before any person can great you, the smells of Italian food greet your olfactory senses. You take a step in to the restaurant and survey the wood-paneled walls and thick red curtains. A host guides you to a table in the corner and provides you with a menu. You can the offerings, which are traditional Italian-American fare. 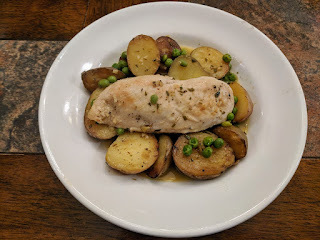 One dish catches your attention ... Chicken Vesuvio. (A dish named after the infamous volcano in Calabria, even though the owner of the restaurant was from Turin, which is located in Piedmont.) You decide to order the dish. What comes next is what becomes not only a traditional Italian-American dish, but a traditional Chicago dish as well. 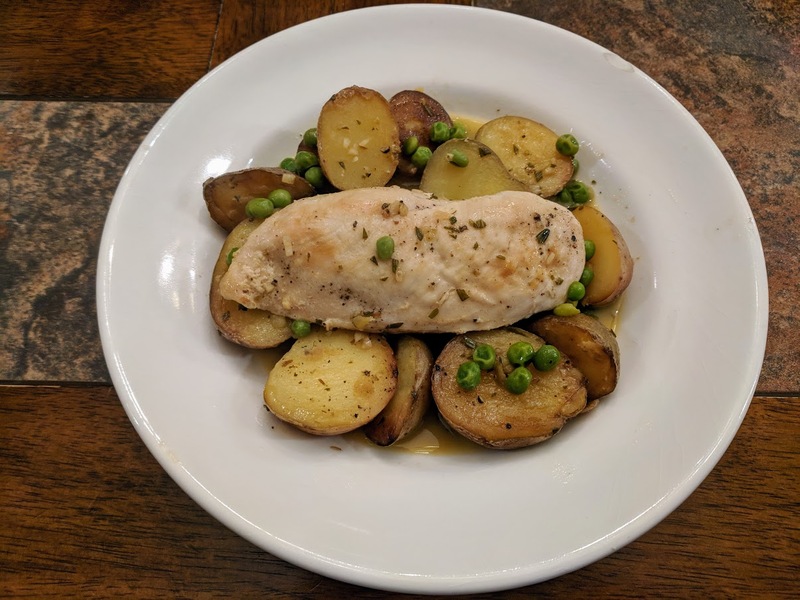 Chicken Vesuvio was traditionally made with bone-in chicken or, quite frankly, an entire chicken deconstructed into pieces. The chicken is prepared with potatoes sauteed in garlic, oregano, white wine, and olive oil. 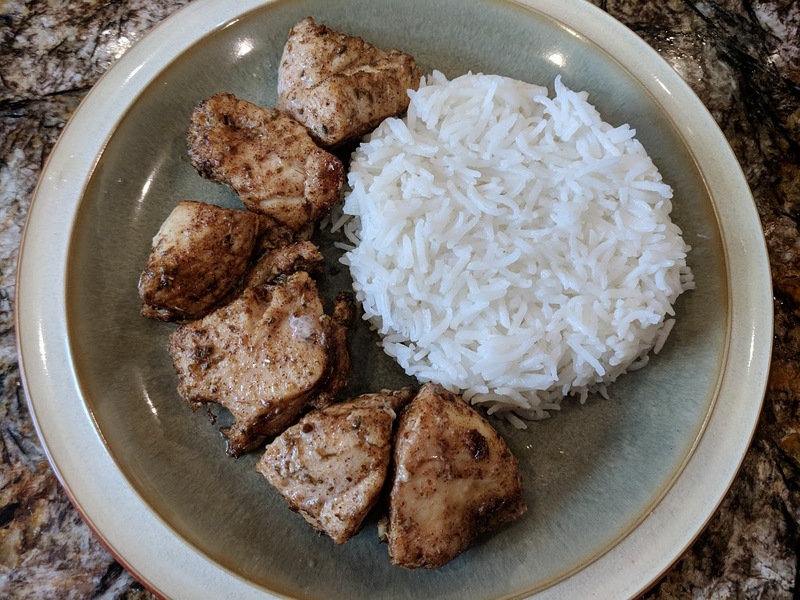 This recipe includes a healthy twist, substituting the bone-in chicken (which would traditionally legs or thighs) with boneless, skinless chicken breasts. In the end, this is a very tasty dish that provides a window into how Italian immigrants who came to the United States are able to create dishes that become their own traditions. Now, I will have to try some other Italian-American classics, like Chicken Francese or Penne alla Vodka. 1. Brown the chicken. Pat chicken dry with paper towels and season with salt and pepper. Heat 1 tablespoon of olive oil in 12-inch nonstick skillet over medium-high heat until just smoking. Brown chicken well, 3 to 4 minutes per side. 2. Continue cooking. Add remaining 1 tablespoon oil to skillet and heat until shimmering. Add potatoes, cut side down, and cook until golden brown, about 87 minutes. Stir in garlic, rosemary, oregano and 1/2 teaspoon salt and cook until fragrant, about 30 seconds. Add broth and wine, scraping up any browned bits, and bring to boil. 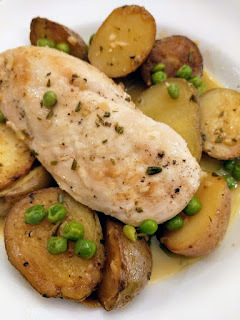 Return chicken to skillet on top of potatoes. Reduce heat to medium low and simmer, covered, until potatoes are tender and chicken registers 160 degrees, about 12 minutes. Using slotted spoon, transfer chicken and potatoes to serving platter and tent loosely with aluminum foil. 3. Finish the sauce. Increase heat to medium high and cook, uncovered, until sauce is reduced to 1 cup, about 5 minutes. Stir in peas and cook until heated through, about 1 minute. Off heat, whisk in butter and lemon juice and season with salt and pepper to taste. Pour sauce over chicken and potatoes and serve. 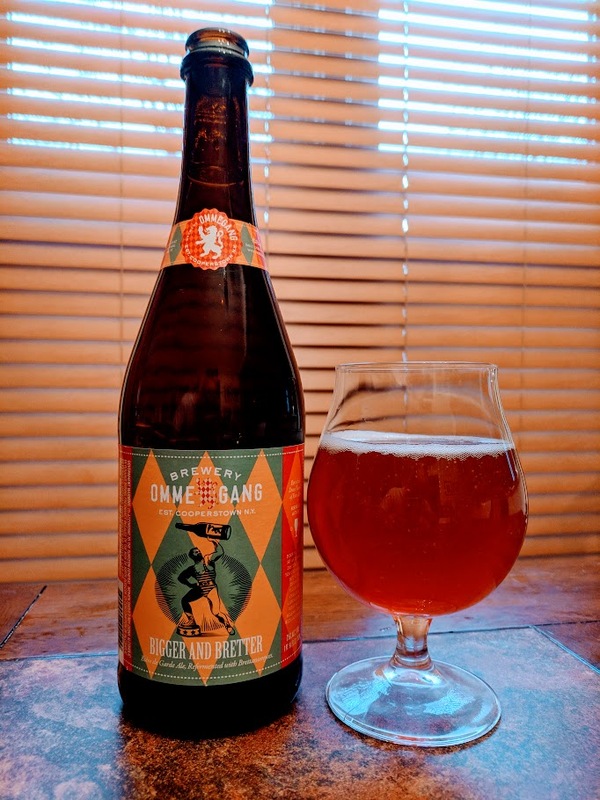 Brewery Ommegang is one of those breweries that I enjoy but which has not found its way into any beer review on this blog. The Cooperstown, New York-based brewery produces some very good Belgian style and French style ales. 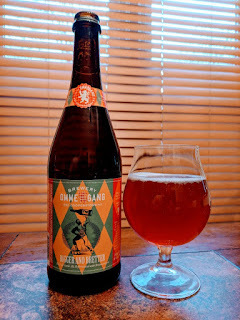 One such beer is the Bigger and Bretter, Ommegang's Biere de Garde that was brewed with Brettanomyces, or wild yeast. Brett beers are for those beer aficionados who also love to gamble. The reason is that some beers brewed with Brettanomyces have very strong aromas and tastes. Think of descriptions "barnyard funk" or "horse blanket." The wild yeast does a number to these beers, which only a fan of Brett beers can love. Other Brett beers are more mild, evoking rather tame descriptions such as "earthy" or "floral." These are the examples of beers brewed that wild yeast that should be tried by a wary beer lover. The reason is that it provides an opportunity for that person to try a beer style that he or she would not otherwise try ... out of a fear of horse blankets. The thing is that one will not really know where the Brett beer will fall on this scale -- from barnyard funk to floral -- until the bottle or can is opened. That is why it is a gamble. Fortunately, the Bigger and Bretter finds itself on the milder side of the scale. The beer pours a orange color, with copper or bronze tones. As the beer rests in the glass, aromas of cherry pie and cinnamon, along with the yeast, rise up to greet the nose. Those elements also include some herbal notes, which could be expected from a Brett beer. When compared to some of the Brett beers that I have had in the past, the aromas of this beer were more modest and restrained. Not only were the aromas more restrained, but so were the flavors. 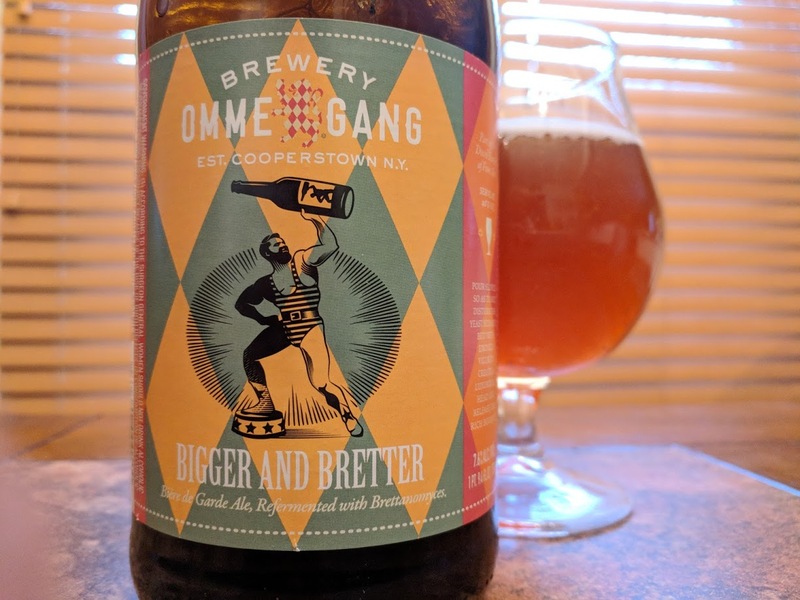 The flavor of the Bigger and Bretter features tart cherries, but the beer lacked some of the "funk" that seems to set Brett beers apart, such as Les Deux Brasseurs or Orval. This beer is a good Brett beer for those who are reluctant to try a beer brewed with wild yeast. Unfortunately, for those people, Brewery Ommegang has retired this beer. For those who love Brett beers, you can still find Orval, which is perhaps one of the best Brett beers out there. My beautiful Angel and I recently purchased an air fryer. I have been intrigued by air fryers for quite a while. Generally, I do not like to deep fry foods, and, for that reason, I do not own a deep fryer. Moreover, when a recipe calls for something to be fried in 2 to 3 inches of oil, I find a different way to cook it. Often times, I use the broiler, the grill or a wok. It was my effort, however little, to try to cook in a healthier way. Last Christmas, I got an air fryer book from my parents as a gift. The book has a lot of great recipes, which I want to make. Recipes such as African Piri-Piri Chicken drumsticks, Gai Yang (Thai-Style Cornish Game Hens), and Tandoori Chicken. 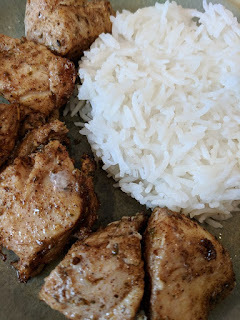 It is not just chicken, there are interesting recipes like Dukkah Crusted Halibut, Char Siu (Cantonese BBQ Pork), and Nem Nuong (Vietnamese Grilled Pork Sausages. Needless to say, I have a lot of cooking ahead of me. I have started a label, "Air Fryer Recipe," to keep track of all those recipes and my cooking. More importantly, Chicken Shawarma was probably the easiest recipe to make in the book. It was culinary equivalent dipping your toes in the shallow end of the pool. A quick way to try out the air fryer to see how it worked and whether the end result would be delicious. I am happy to say that the result was very delicious. I can't wait to try some more of the recipes in this book. 1. Prepare the chicken. In a small bowl, combine the oregano, cayenne, cumin, coriander, salt, cinnamon and allspice. In a large bowl, toss together the chicken, vegetable oil, and shawarma spice to coat. Marinate at room temperature for 30 minutes or cover and refrigerate for up to 24 hours. 2. Cook the chicken. Place the chicken in the air fryer basket. If using dark meat, set the air fryer to 350 degrees Fahrenheit for 15 minutes or until the chicken reaches an internal temperature of 165 degrees Fahrenheit. If using white meat, set the air fryer to 350 degrees for 10 minutes (turning the chicken half way through) and then set the air fryer to 400 degrees for 2 minutes. 3. Finish the dish. Transfer the chicken to a serving platter. Serve with tzatziki and pita bread, or with rice. I am a chef at heart. I do not have any professional training, and I do not work in a restaurant (let alone own one). I love to cook for myself, my beautiful wife, family and friends. I also love craft beer and fine wine, which I often try to pair with what I cook. Finally, I am not a professional blogger. Rather, I created this blog to share my hobby with my family and friends, as well as provide them with an opportunity to follow me on my culinary adventures through great food, beer and wine. ENJOY! (c) Keith R. Bolek (2008-18). All rights reserved. This blog is for myself, my family and friends. Picture Window theme. Theme images by kcline. Powered by Blogger.